“Summertime, and the living is easy.” Well I’m sure whoever wrote those lyrics meant to evoke a certain imagery, but they were not describing reality! But if you tell me it is summertime and the tomatoes and basil are growing abundantly, then you got me! Though my house has a large yard, the only thing that grows really well is boulders. Really big boulders. Two ton and up boulders. That leaves the porch as the sole sunny spot to grow food. My organic front porch container garden consists of basil, oregano, thyme, rosemary and two Topsy Turvy tomato planters. Yes, I saw those commercials for the Topsy Turvy planters and thought they were a bunch of crap. Then I actually bought some, and they are fantastic! Both planters are loaded with fruit, and as a bonus they lend some shade to the front of the house. Food and shade, what more can you ask for? Oh yeah, wine. I just picked some ripe tomatoes, and trimmed my basil plant to make a small batch of pesto. I didn’t want to make pasta, and was too lazy to make pizza. 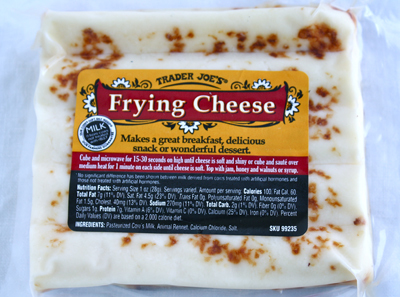 I rummaged through the refrigerator and found some frying cheese I bought at Trader Joe’s to try. Frying cheese, like Haloumi cheese from the island of Cyprus, is a firm cheese that does not turn into a gooey glob at high temperatures. It holds its shape, even though it does soften. Warmed cheese topped with fresh tomatoes and pesto sauce. Yes, that sounded very tasty indeed. This recipe is not really a recipe because it is so simple and there are not specific quantities. Feel free to add other toppings as well, such as toasted pine nuts, chopped olives or roasted peppers. Cut the frying cheese into cubes, bite size or larger. Heat a nonstick pan over medium heat. Saute the cubes on each side for a few minutes, until the cheese is softened. 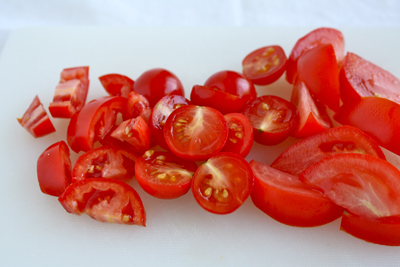 While the cheese is frying, cut the tomatoes into small pieces. Place the cheese onto a plate, drizzle with pesto sauce and top with tomatoes. Eat. You can substitute with Haloumi or Paneer cheese. Try a specialty store, such as Whole Foods or a cheese store. A Middle Eastern or Indian market is also a good bet. We used the fried cheese in a ‘pizza salad’ with tomatoes, spinach and pesto…delicious! So disappointed that the frying cheese has been discontinued! This is a great post, I’ve keep passing up the frying cheese at TJs because I hadn’t figured out when I was actually going to use it. This is perfect. This is what I’m talking about! Warm cheese is everything. 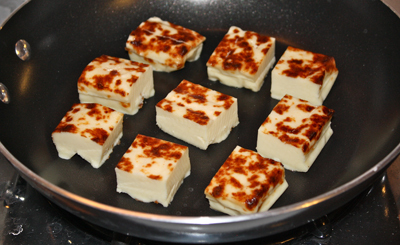 Haloumi is a type of frying cheese. I think mine was more of a “generic” frying cheese. Gershwin! I remembered Porgy and Bess, but couldn’t remember Gershwin. Yummy! I am adding the frying cheese to my grocery list for my next trip to TJ’s! I have plenty of pesto and basil and cherry tomatoes to make this wonderful dish. Pesto and tomatoes together with cheese? Delicious. Yeah they hate when you’ve got mad skills! I just made a tomato-caprese pizza. I love the combo of tomatoes, mozarella and basil. I’ll definitely have to try this. 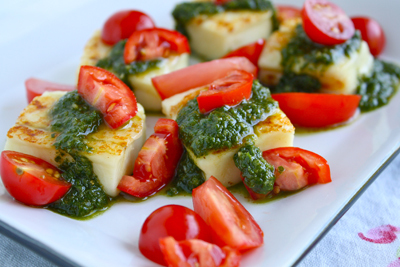 I’ve never had Haloumi cheese but I’m dying to try it. I found it in my local grocery store so I definitely am going to try it. Too bad there’s no Trader Joe’s in Florida, I’d love to go there. 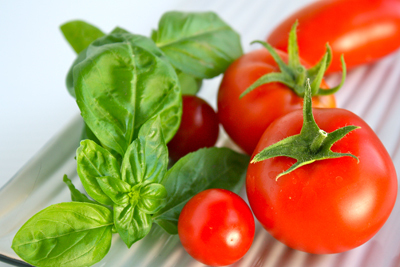 This looks soooo yummy…cant wait to try it with the tomatoes out of the garden! I am going to suggest using Dorot Chopped Basil if making your own pesto sauce. They are super easy and no waste! Also you. You can go to http://www.mydorot.com to find locations. When I saw the pic on Foodbuzz, I was immediately curious as to what that cheese was. Thanks for sharing and congrats on making the Top 9 today! This looks delicious! I’ve never seen frying cheese in Canada, but I’ll be sure to keep my eyes open so I can make this! Yum! I love Haloumi cheese, specially cooked. I am also a big fan of Trader Joe’s.